Brian Butler offers advice on taking a behavioural approach to health and safety. He also discusses the factors impacting the industry today - highlighting how new ways of working at height are positively influencing site safety. Many businesses are dependent on delivering solutions that involve people working at height. Wouldn’t it be ideal if employees and sub-contractors thought continuously about keeping not only themselves safe but also the whole team safe, and the public too? By taking a behavioural culture approach to health and safety this can be achieved. While some companies have prioritised safety, this is dangerous ground as priorities by their very nature, are subject to change. Values, on the other hand, are not. Health and safety should be a core value, inbuilt into the business’ ethos at board level as the first step. Making health and safety the overriding focus will ensure it becomes a natural part of daily business life, and not simply an obligatory response to legislation. More companies should strive to achieve a level of unconscious competence, where people act safely as a matter of course without having to actually think about it. Where health and safety is concerned, it is of course the business’ responsibility to ensure that the company complies with all the necessary legislation. Setting key performance indicators, measuring goals, and minimising risks will all add to robust health and safety practises. However, by taking a tailored and collaborative approach to health and safety - no matter what size the project or level of complexity, systems can be designed to ensure personnel are safe, especially when working at height. An open door policy encourages people to report all near misses or changes in conditions immediately. This ensures that everyone is on board to identify risks on a daily basis, which makes an impressive contribution to the constant improvement of the business’ health and safety record. One particular initiative that works really well is to take a ‘roadshow’ approach, ideally on an annual basis. By physically getting out and visiting the workplaces; sites, offices and factories, it provides the ideal opportunity to remind employees and sub contractors of the working at height health and safety procedures, while changing perceptions both inside and outside the business. As ever, systems and process are only as effective as the people implementing them. To ensure procedures are being used and followed correctly, make sure in-house health and safety managers are visiting projects to undertake inspections and compliance audits at regular intervals, for example once a month. It can be helpful to implement frequent site inspections by external consultants too. Regular project inspections by senior management and directors also encourage on-going communication and the review of systems. By working collaboratively, your health and safety policies will evolve constantly. This means that when it comes to industry inspections, everything is in place for auditors reviewing compliance with standards such as BS OHSAS 18001, TUV, CHAS and Achilles. Like many international countries, the UK construction sector has a multinational workforce and this has influenced how our industry undertakes training. Effective communication is absolutely key to keeping everyone safe – especially when working at height and in challenging conditions. It is essential to adapt work methods and training to ensure it is suitable for all teams. For example, it is worthwhile ensuring training programmes ask more questions of individuals to clearly ascertain the level of understanding from the outset. Another recommendation would be to ensure there is the correct ratio of translators and supervision on each project to ensure communication is not compromised. 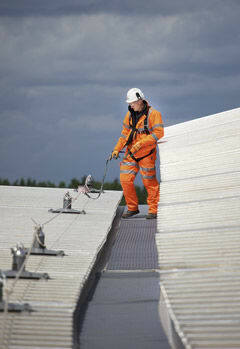 When working at height there are several main issues contractors have to think about. For contractors it is often a task they are doing day in, day out and they should be experienced, well trained and wearing the correct PPE. For many contracting teams, working at height is second nature, but it is essential to work hard to avoid complacency. One of the main issues can be other trades working around or above your team or accidently walking into your exclusion zone. In many cases it is about keeping others out, and away. Of course tool tethering also has a large part to play. Working on fragile roofing systems also can be challenging; however, it is simply about more planning and more care. By assessing all the considerations and safety factors when working at height on fragile roofing systems, all issues can be eliminated. For example ensure that crash deck systems or netting have been factored into the project budget at the estimating stage. When the health and safety procedures are followed and with a competent and experienced workforce – installing a fragile roof should be no different to any other. With construction output on the increase, it is no surprise that digital engineering, BIM and off-site manufacturing continue to gather momentum. Now with an integral role to play in many projects, all are widely accepted as having a significant positive impact on health and safety. In recent years, BIM has been a major talking point in terms of both its potential and the challenges of integrating it into the design and build process. For companies involved in the construction of UK publicly funded work, the next phase of this is the need to be digitally compliant. Prater is proud to be among the pioneers when it comes to integrating digital engineering and BIM - the benefits are already clear, especially for situations where our teams are working at height. From a health and safety perspective it enables early identification of potential issues, giving our supply chain time to address them and, as a business we are able to supply a clear view of delivery requirements for more accurate planning and improved on-site safety. It also facilitates easier risk assessment and identification of associated costs. As a health and safety professional, I would recommend your business is BIM-compliant by developing its approach to collaboration, structured data and sharing of information. One construction site in particular that has benefitted from 4D modelling and a new way of working at height is the large-scale project at Glasshouse Gardens at The International Quarter (TIQ), London. The project started on site in June 2014 and comprises the construction of two residential towers, which will house some 360 flats. The 30-storey S7 building is due to complete in May 2017 and the 17-storey S8 tower is due to complete in October 2016. For this project, the proposed cladding design is associated with lower level structures. However, working collaboratively with Lendlease and the frame contractor, Prater created and adopted a new access methodology, replacing the need for fixed scaffolding and implementing a unique climbing screen-working installation process. This enabled teams to take the cladding up to high levels, improve accessibility and crucially - keep to project timescales. Initially a 4D model was created to help plan the build, as a result the team is able to account for all the different weather conditions and sequence the multiple screens as they move up the two buildings simultaneously. The model is invaluable in helping the client and supply chain contractors to visualise the project, especially from a health and safety perspective. Using the screen-working approach, the team has excellent access to the outside of the buildings while maintaining a safe environment in which to work. Appealing to architects and specifiers, this alternative construction method demonstrates greater flexibility, allowing things to be done that couldn’t be achieved with traditional scaffolding. When working off scaffolding, it’s clearly static and fixed to the ground. The screens, however, are moving. The key is to make sure everyone’s aware of that and ensure activity is controlled properly. This approach enabled the teams to complete a floor across both buildings every eight days. The screens on both buildings then move up. It’s an impressive scope of works being delivered safely to a tight time programme. The benefits of off-site manufacturing are well documented; however, perhaps most significant is the reduced risk on-site. As we all know, when work is taken away from site into a controlled environment, unnecessary work at height is reduced and congestion on-site is eased. Ultimately, this creates a safer and more manageable project. In the case of large-scale complex projects, where a unique product or bespoke design is piloted; or if there is absolutely no margin for error, then the ability to construct a mock-up of test products and methods off-site can be crucial. Additionally, it enables companies to employ trainees or apprentices in roles within factories or warehouses – up-skilling the industry - and giving teams the opportunity to learn installation works off-site to reduce on-site complications. It should be kept in mind, however, that off-site manufacturing can also affect teams in different ways. For example, when the materials are delivered, contractors often feel more pressure to complete the installation as quickly as possible. While this is important to meet construction deadlines, work must be implemented safely. In addition, with regular large deliveries - of what can sometimes be large building components – sites can become congested and more hazardous and this means there has to be much tighter control over the programme, delivery and logistical process. A recent example of how offsite manufacturing helped Prater minimise its working from height risk was the team’s involvement on the BSkB project. With around 8,500 Sky staff working from several locations, the construction of a new campus at the company’s Isleworth site allowed BSkyB to streamline operations and improve communications by condensing the number of staff buildings. This was the UK’s largest glue laminated timber project and Prater was responsible for the design, testing and off site engineering of the complete external envelope package. The scope of works included a 15,000 sqm pre-manufactured roofing system, accommodating 417 roof lights, as well as 10,000 sqm of external composite façade with an external rain screen cladding system. Our in-house team was responsible for the roof design, carrying out a comprehensive programme of testing in relation to fire, acoustics and impact. Mock-ups were created both for approval on site as well as testing at various specialist laboratories. The size and scale of the project and necessary build timescales meant that off-site manufacturing played a vital role – with the large roofing cassettes brought to site and craned into position. Off-site construction enabled us to plan logistically and deliver a project that not only satisfied the difficult build schedule, but also contributed to overall health and safety, by reducing work on site. The project also benefitted from 4D modelling to ensure effective communication of the access and logistics strategy as well as the on-site coordination of interface trades. The UK has become a world leader when it comes to finite details and in depth analysis, which has helped improve health and safety processes. In addition, attitudes toward health and safety have improved immensely. From Prater’s perspective however, taking a behavioural culture based approach to health and safety, and embracing these new ways of working has contributed substantially to the company’s market leading position. Its collaborative approach is reflected in the fact that 93% of contracts are with key repeat business clients. As a business, we all have one aim when it comes to health and safety, to be recognised as the safest building envelope contractor in the UK.